This is a typical Kerala delicacy, but done my way. Meen Pattichathu is a coconut based, tangy, fish dish that is cooked in a clay pot. It does not have gravy and the pieces of fish are wrapped with crushed grated coconut, chillies, ginger, garlic, curry leaves, and cilantro. If I was back home in India, I would use a grinding stone to crush all the ingredients, but I am using a food processor to do the same. Crushing the ingredients in the food processor infuses the flavor of the chillies, and ginger into the grated coconut. So about five or six short pulses in the food processor will do the job. I know a lot of readers will want to know about the Malabar tamarind (puli). The botanical name for this ingredient is Garcinia Cambogia. If I am wrong, I will definitely hear from my brother, the botany expert in the family! If you cannot find this ingredient, you can substitute it by using tamarind. It will, however, compromise the flavor of the dish. Malabar tamarind is used to add sourness to the Meen Pattichathu, and then it is discarded before serving the dish. In the picture, you will see Malabar tamarind. Once in two years, I visit my family in India. My sister-in-law, Lissie Ammama, faithfully gives me a stash of puli to bring back with me to the U.S. Thanks, Lissie Ammama, for all the years you’ve shared puli with me. Needless to say, I think of you when I make Meen Pattichathu. I hope you will try this dish, and send me your comments. Add fresh coconut, dry chillies, ginger and green chillies into a blender or food processor and crush. Five or six pulses in a food processor will crush the ingredients. Mix the crushed ingredients, garlic, turmeric, one sprig of curry leaves, Malabar tamarind, which is torn into small segments, half the shallots, fish, two tablespoons oil and salt. Add water so it comes up to the level of the mixture in the pan. Cook on medium-high heat for ten minutes and then turn the heat to low. Cook until the water in the pan evaporates, tilting the pan once in a while to make sure that the fish and coconut are not sticking to the bottom of the pan. Heat two tablespoons of coconut oil in a small frying pan over medium-high heat. Add mustard seeds and when they sputter add the remaining shallots. When the shallots turn light brown add the sprig of curry leaves, and cilantro. Remove from heat and pour over the Meen Pattichathu. Cover and let stand for at least 30 minutes before serving. 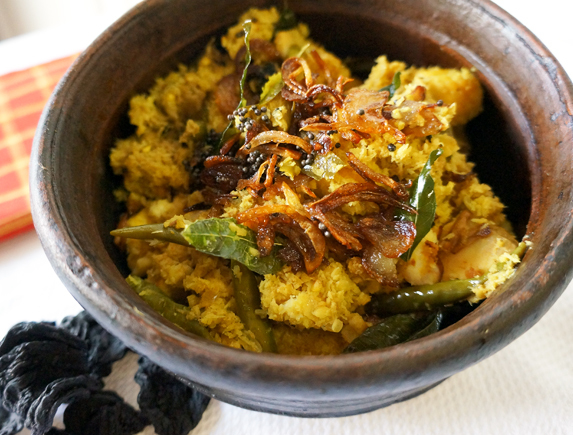 This dish tastes best the next day when the tartness from the kudum puli permeates the fish. This entry was posted in Fish, Non-vegetarian and tagged Coconut, fish, kerala, Tilapia by Margaret Christo. Bookmark the permalink.